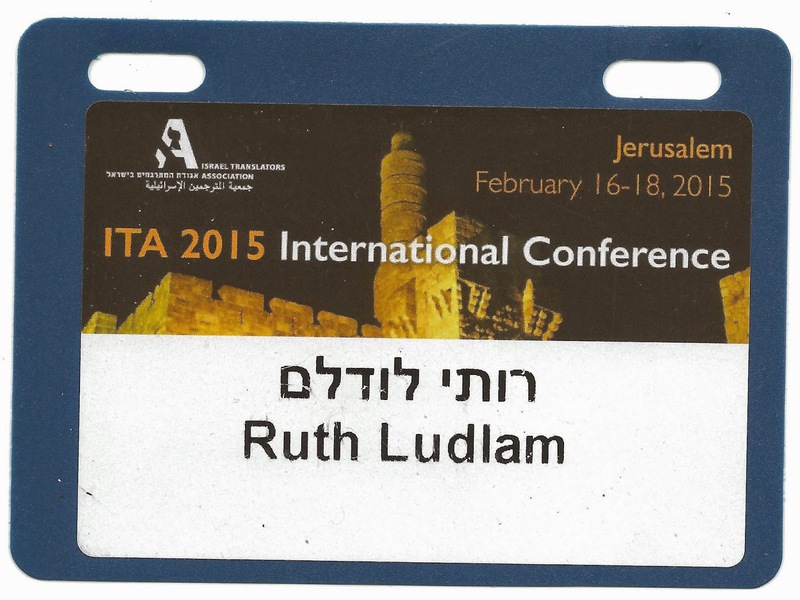 This year, as in many previous years, the annual conference of the Israel Translators Association was held at the Crowne Plaza Hotel in Jerusalem. I understand that participation was higher than ever. The first evening's gala event was held at the Bible Lands Museum. After a reception, we were divided into groups and taken on a guided tour. The tour focused on the development of languages in the ancient world, and we saw findings including written texts from Egypt and Mesopotamia. Then we visited the new exhibition, By the Rivers of Babylon, containing findings, particularly Akkadian texts on clay tablets, relating to the Judean community there during the Babylonian Exile (about 600-500 B.C.E.). Of course, the short tour was only a taste of the museum, which would be well worth visiting again. We then had dinner, followed by an after-dinner lecture. The speaker was Simcha Jacobovici, who explained the story behind his book, The Lost Gospel. He presented his theories about the life of Jesus, which were somewhat controversial, but possibly partly correct. It made an interesting evening. The next day of lectures opened with a talk about objectivity in journalism, by Eetta Prince-Gibson. She explained with cogent examples why objectivity is impossible and is not even desirable in journalism. To be objective means not to have any personal opinions or connections to reality. Since we are all human and exist within a specific context, it would be better to be aware of our lack of objectivity, to acknowledge it, and to seek a different guideline instead. She proposed some ethical guidelines, such as compassion and empathy, and also suggested that instead of seeking to simplify the news, writers and readers should seek complexity. This was a fascinating talk that should be useful for translators and writers of all genres. Next was a presentation by Yael Sela-Shapiro about using the free tools offered by Google. It was interesting to see the possibilities for collaborative working involving using the Cloud. However, many translators raised questions about confidentiality, and when I thought about my clients, most of whom are much less technically capable than I am, I realized this was not really relevant to my work. Google was one of the conference's sponsors, and the lecture was technically a marketing presentation, though since the tools are free it didn't feel like "trying to sell something", and Yael sometimes mentioned competitors' tools as well. After a short break, the conference divided into four tracks. As always, this made it difficult to choose which lecture to attend, and I hope some of the lectures I missed will be given at the ITA's monthly events during the coming year. I went to the Academic Track, and the first lecture was by Racheli Lavi, about the Ivri software for correcting mistakes in Hebrew. While the software seemed useful enough, I found it disturbing that this was presented as a lecture in the academic track and was not clearly marked as a commercial presentation, at least in the English section of the conference program. I saw the Hebrew abstract of the presentation only later. I have no problem with the sponsors making commercial presentations, but I believe they should be in a separate track, especially when the presentation discusses price options. The next lecture was by Nuria Brufau-Alvira, about gender equality in translating. She gave examples of gender analysis and intersectionality, showing how increased awareness of the ways language does or does not promote equality can lead to more equal writing. Of course, much depends on the context and the target audience, and sometimes trying to write for equality ends up distracting the reader from the content of the text. After lunch, I moved to the Business Track to hear Micaela Ziv speak about business ethics. This lecture was made interesting by her comparison between how she handled ethical issues in her translation business and the lessons she had learned about business ethics from growing up in the Sieff family, who used to run Marks & Spencer. The lessons about reliability, customer service, and treating employees as assets served Micaela well. She contrasted her ethical way of doing business with the typical Israeli tendency to become confrontational and avoid taking responsibility. Next, Brazilian translator Fernanda Rocha addressed the issue of how we see our role as translators. The point of this lecture was to encourage translators to combine their professional skills with a professional attitude. She urged us to stop using the combination "professional translator", since translator is already a profession, and nobody says "professional doctor" or "professional lawyer". When people pointed out that there seem to be many less qualified so-called translators who are not really professional, she encouraged ignoring them and showing our quality through our work. Then I heard French translator Anne Diamantidis explain how translators can use Facebook for professional networking. This is not usually the place to find end customers, since people don't come to Facebook wanting professionals to market at them. However, it is possible to use it to create and maintain relationships with existing clients and with colleagues. She discussed the difference between creating a separate business profile for your translation business, and alternatively creating different groups among the friends on your personal profile and addressing each post to the relevant groups. Circumstances meant I was unable to stay for the final day this year, so I missed out on many more interesting lectures and opportunities to meet colleagues. The conference was enjoyable and interesting as usual, and I look forward to next year's conference.